While I love the aromatherapy benefits of wearing essential oil jewelry, it’s not easy to find modern designs that match my style when I’m shopping on Etsy or in wellness shops. I’ve recently fallen in love with how fun and easy it is to make things with air dry clay because there is no kiln or baking required, so I thought I’d try my hand at making an essential oil diffuser necklace that featured a simple and modern clay pendant. I liked the results so much that I decided to make some key chains with my pendants as well! If you’re like me and love diffusing oils while driving, you’ll definitely want to give this easy DIY a whirl. Step 1 — Prep work space and roll out clay. Cover your work surface with craft paper or wax paper. 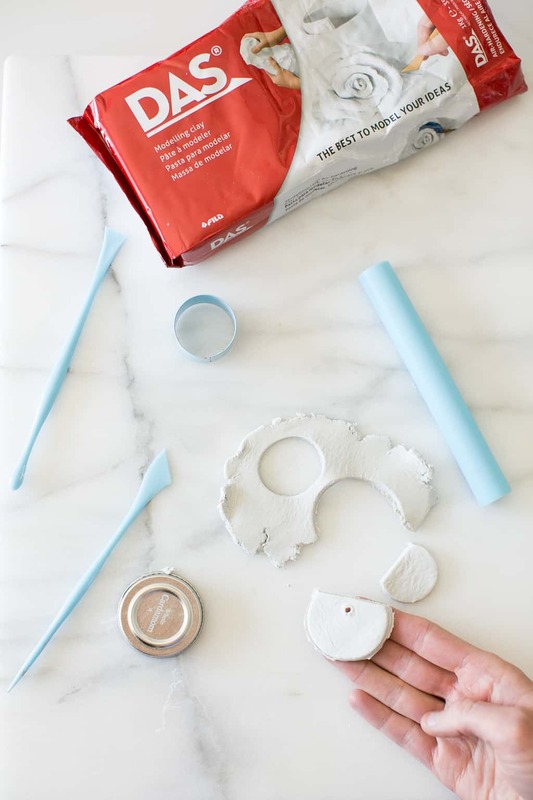 Cut or break off a handful of air dry clay. 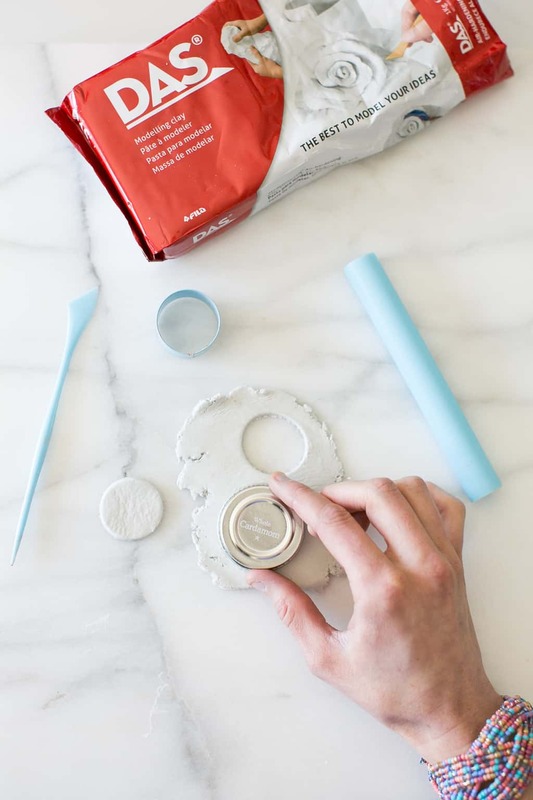 Add a few drops of water to clay to soften and knead with hands to incorporate water. Using rolling pin, roll out clay to desired thickness. Mine was about 1/8 inch thick. 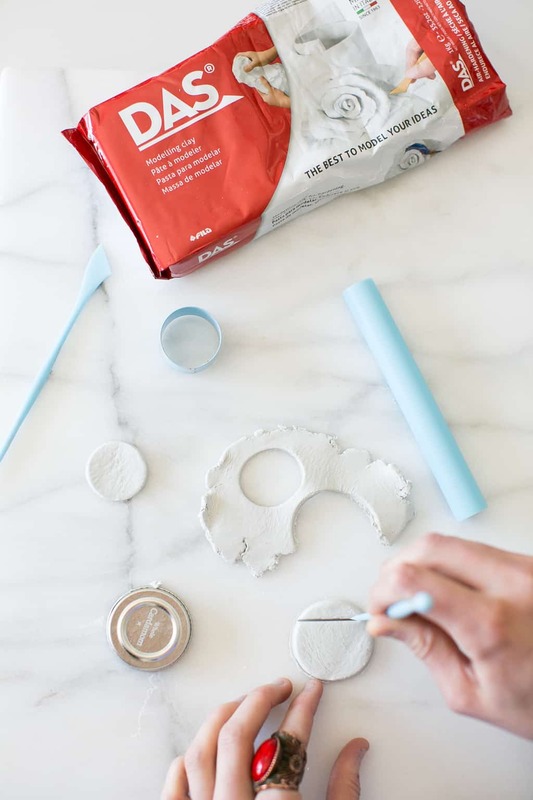 While you can use a standard rolling pin, I’ve found that the plastic rolling pins you can find in the clay section of the craft store to be the easiest for clay work and clean up. Step 2 — Cut pendant shapes. Using clay cutting molds, cooking cutter or round lids to spice jars, cut 2 circles shapes from the clay. One circle should be about 1/3 smaller than the other. Take your clay slicing knife and cut off the top 1/4 of the larger circle in a straight line. Repeat with the smaller circle. These two pieces will now become your pendant charms. Step 3 — Punch holes in your pendants. Using your hole cutting tool, make a hole in the center top of each circle several millimeters below the line you just cut. Make sure the hole has fully pierced both sides of the charms. 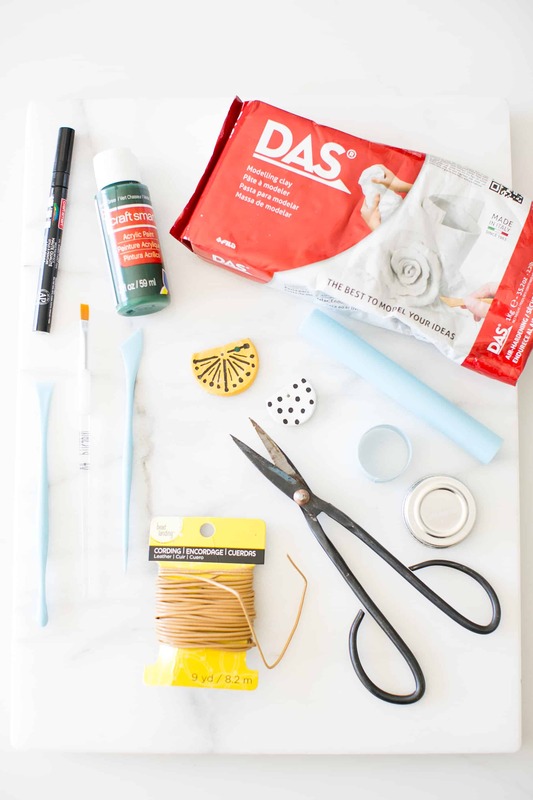 Set charms aside on wax paper or craft paper to dry according to DAS package instructions. Ours dried completely overnight. Step 5 — Paint pendants. Once dry, use acrylic craft paint to paint pendant charms. Paint one side and allow to dry before repeating with other side. A medium or fine-tipped paint marker also comes in handy to create easy patterns on your pendants. I used mine to make polka dots, stripes, and other fun designs. Step 6 — Assemble pendant layers. 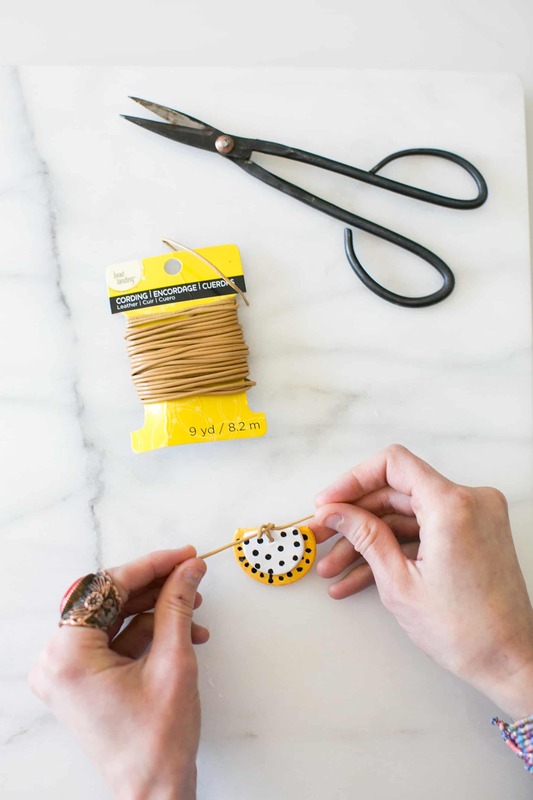 After paint has dried fully, stack the smaller charm on top of the larger charm and thread cording through each hole. To keep the charms in place before attaching it to the necklace, start by tying a square knot with your cording. To make this knot, you’ll tie two overhand knots — first right over left then twist. Then go left over right and twist. Make sure both parts of the cord exit the knot together. Pull knot tightly closed but make sure to leave a small amount of space between the knot itself and the top of the 2 charms — that space is where you’ll slide the cording that will form your necklace in the next step. Trim any excess cord close to the knot. Step 7 — Measure length of necklace. Cut another length of cording. The length here will depend on how long you like your necklace with a few inches extra added for tying. I like my necklaces long, so I wanted my finished necklace to be about 24 inches. To allow room for tying the ends, I cut my cord to about 28 inches. Step 8 — Assemble complete necklace. Slide the cord through the small space you left between the square knot and your charms. Tie another square knot at the back of your necklace and trim excess cord. 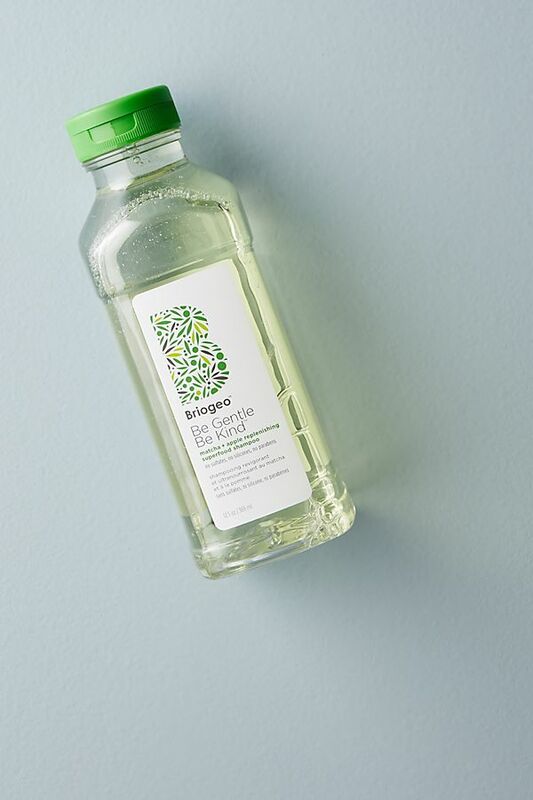 Now it’s time to apply your essential oils. 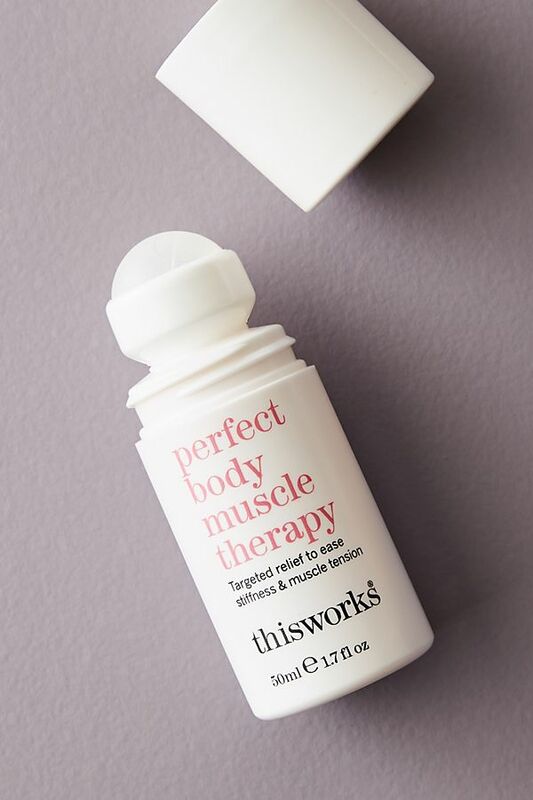 You’ll want to apply a few drops to the top charm and allow to soak in. You can use your favorite essential oil or create a custom mix to suit your needs and mood. Just keep in mind that undiluted essential oils shouldn’t be applied directly to your skin, so you’ll want to place the necklace on a flat surface to apply oils, allowing time for them to soak into the clay before wearing the necklace. Once the scent wears off, you can reapply oils as often as you’d like. 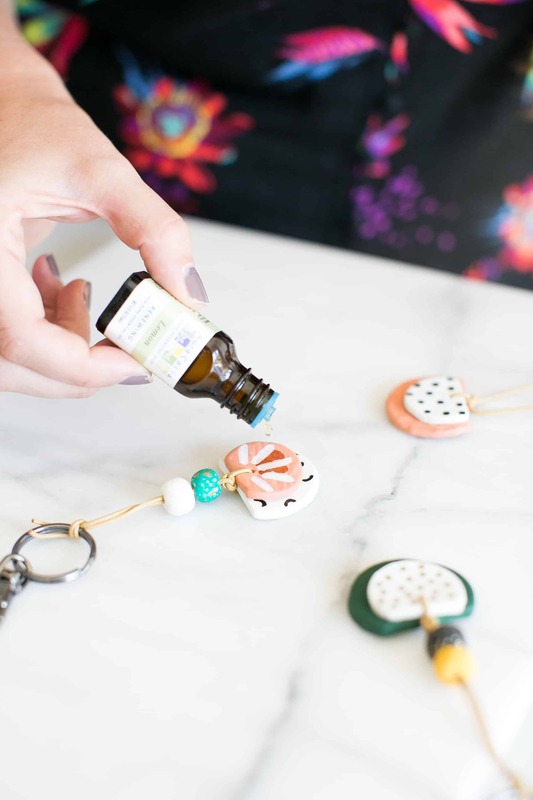 Once you’ve mastered this necklace DIY, I would suggest making a few extra pendants to create an essential oil key chain diffuser as well. 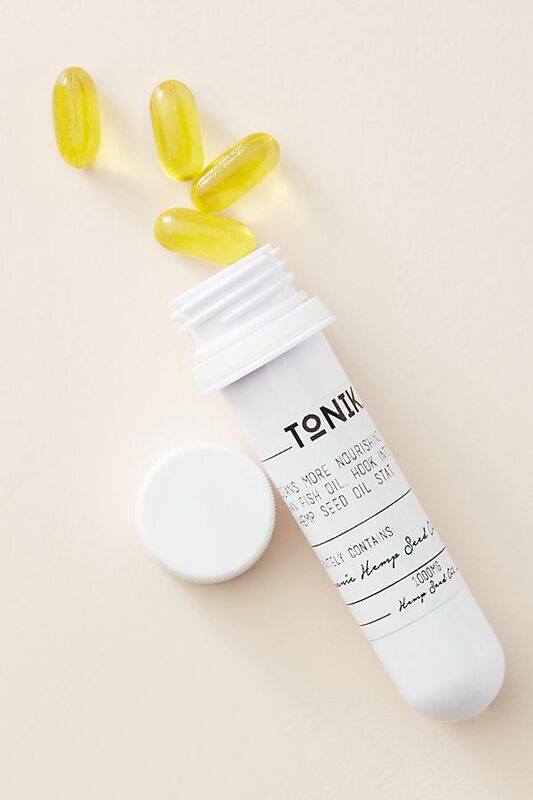 These make great gifts for friends who have long work commutes. 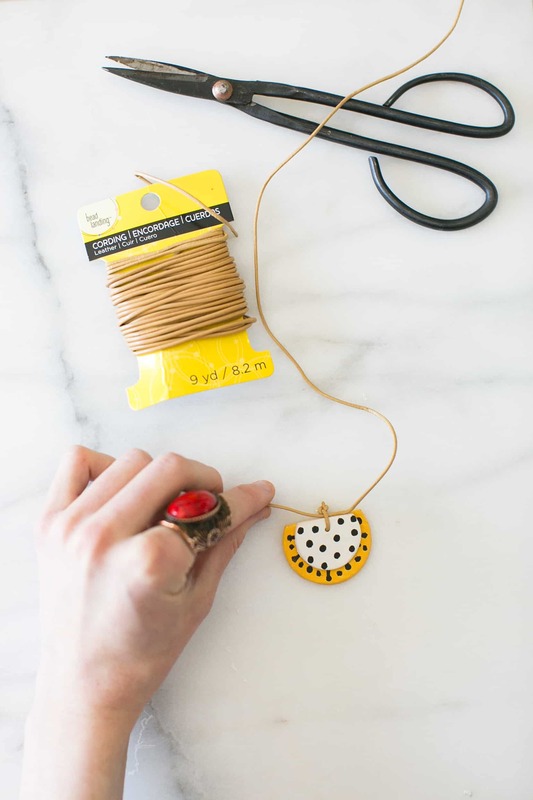 Step 1 — Make use of the steps you learned for your DIY necklace. Follow steps 1-6 for our essential oil diffuser necklace. Step 2 — Measure length of key chain. This time instead of cutting a necklace-sized length of cording, cut 11 inches of cording to make your key chain. Then slide the cord through the small space you left between the square knot and your charms. Step 3 — Accessorize with clay beads. Slide two beads onto the cording, making sure you pull both sides of the cording through the holes of each bead. If you’d like to make your own clay beads, follow our tutorial for creating DIY essential oil diffuser beads with air dry clay. Step 4 — Tie knot to complete. To attach the key chain to a key ring, tie an overhand knot toward the end of the cording. Trim excess cord. 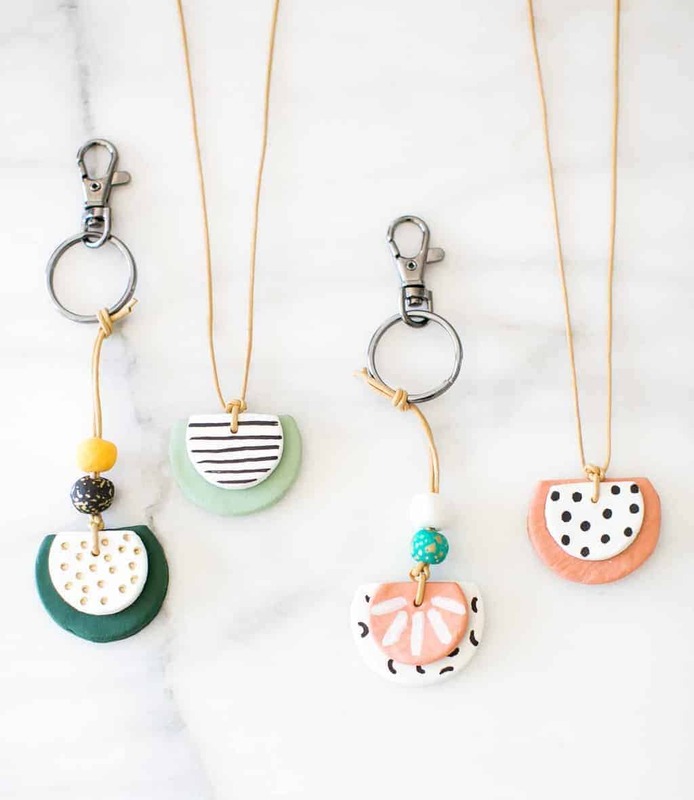 You’ll apply essential oils to your key chain much in the same way as you would for you essential oil necklace: Place your key chain on a flat surface, add your favorite essential oil to the clay pendant and allow to soak in. I prefer lavender to help me keep my cool in traffic, but if you’re road tripping this summer, opt for rosemary, grapefruit, or peppermint to help you stay alert on your drive. But it is very easy to make. I love it! Thanks for this great DIY idea. 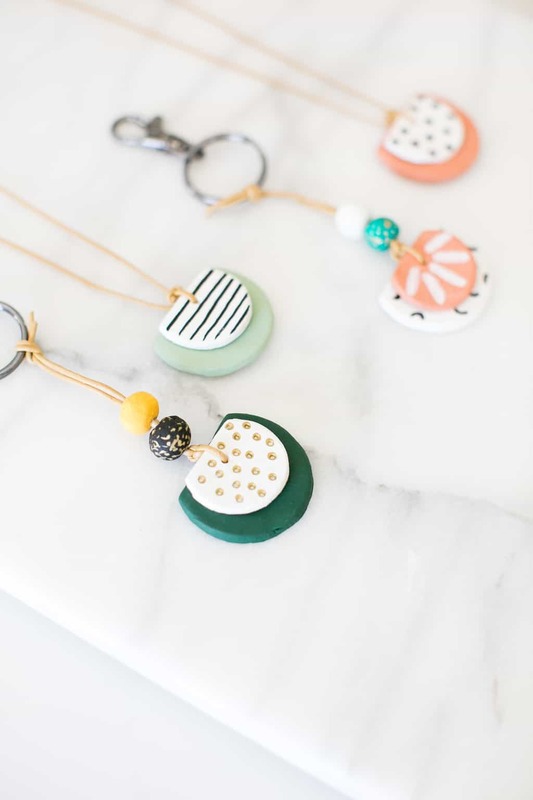 I love how cute and modern your necklaces and keychains are!